Steel vs. Aluminum: Which Truck Beds Are Better? Truck owners who need a new truck bed typically must choose between steel and aluminum. Steel has been the traditional choice, but aluminum truck beds have been gaining popularity since they entered the market in 2000. The best type of truck bed is currently an issue of debate among truck owners, with cost, strength, weight and maintenance being the most important factors. However, after comparing all the factors, Aluminum beds seem to be the better choice for truck owners and the direction most truck beds will take in the future. An aluminum truck bed is generally more expensive than a steel truck bed, although aluminum beds have tremendous benefits. Steel is generally strong enough but only with the burden of heavy weight. Aluminum is less subject to corrosion and therefore requires less maintenance, especially in salty environments. However, all truck beds benefit from regular cleaning to prevent corrosion due to long-term exposure to salts. In addition to cost savings, there are other benefits of Aluminum vs. steel. Aluminum produces fewer greenhouse gases than other metals, making it more ‘Green’ than steel. Pure aluminum generally has one-third of both the weight and strength of steel. However, aluminum truck beds are made from aluminum alloys that are significantly stronger than pure aluminum. These alloys are still more than 95 percent aluminum, with metals such as chromium, copper, titanium and zinc comprising most of the remaining five percent. Other metals are also present in small amounts to further tailor an aluminum truck bed’s characteristics.”By adding elements like silicon, magnesium and lithium to pure aluminum and through special processing techniques, aluminum can be engineered to be as strong if not stronger than some steel.” (Aluminum.org) The overall strength of an aluminum bed is generally comparable to that of steel. 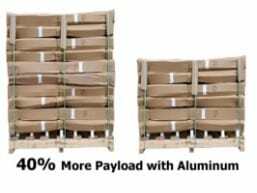 The lower weight of an aluminum truck bed also provides other advantages, such as increased gas mileage. Truck owners who have used both types of truck beds consistently report that an aluminum truck bed provides a smoother ride than a steel bed. Some owners even say that a loaded truck with an aluminum bed gives a smoother ride than a steel bed that’s empty. 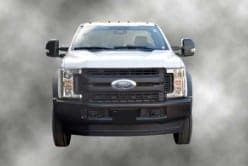 “If you can use technology and materials to take weight out of the vehicle, you’ll always end up with the best solution,” says Pete Reyes, chief engineer for the 2015 Ford F-150 (Forbes.com). All steel alloys contain large amounts of iron, making plain steel highly vulnerable to rust. Manufacturers typically protect steel beds with various galvanizing and galvannealing processes, which generally involve coating the steel with a layer of zinc known as a galvanic layer. Zinc doesn’t rust, but the protection only lasts until the galvanic layer is breached. Some manufacturers also add protective layers of other material such as paint. Regardless of the number of protective layers it has, truck beds are constantly exposed to the abrasive effects of weather and cargo. It’s therefore only a matter of time before the steel is exposed. Galvanizing and galvannealing are also expensive processes, which can erode the cost savings of a steel bed. The floor is often the only part of a steel truck bed that receives a galvanic layer, meaning that the frame is exposed to the elements. Even with this protective layer, steel beds still don’t resist rust as well as an aluminum bed. Aluminum beds generally require little maintenance, with lubrication of hinges and latches being the most significant issue. Steel beds require much more maintenance, which primarily involve the prevention of rust. 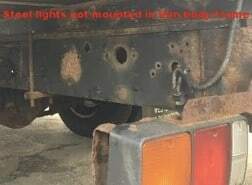 Truck owners must regularly inspect a steel truck bed for bare steel. Scratches in the paint and galvanic layer must be touched up quickly before the exposed steel begins to rust. Steel truck beds that are galvanized or galvannealed don’t need to be inspected as frequently as plain steel beds. Galvanized steel beds are more expensive to repair than plain beds. 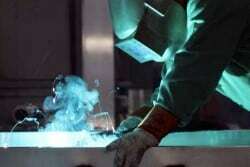 The galvanic layer must be removed before the underlying steel can be welded. Attachment hardware such as screws and rivets also damage the galvanic layer. Repair areas must then be properly finished with a galvanic layer after each repair. The required removal and reapplication of the galvanic layer comprises a significant portion of the repair process for galvanized steel beds. Today, with the high use of aluminum in pickups and cars, body shops everywhere are equipped to weld aluminum. When it comes to cutting out a damaged component, aluminum is significantly easier to cut. Additionally, steel will have paint on it that has to be removed prior to welding.